Define what constitutes the lowest acceptable threshold for success, for nature and connected outcomes for human well-being. Provide direction as to the magnitude of change needed, against which strategies can be compared. A minimum goal statement that is specific, measurable, and time bound. Description of strength of available evidence for the minimum goal statement. In the course of drafting a minimum goal statement, your team should reach agreement on what constitutes a sufficient amount of change in the key challenges to contribute to systemic change. You will be setting a minimum bar that will be used to screen strategies, ensuring that any that go forward will have sufficient impact. An important note about terminology: The terminology of CbD 2.0 that links actions and intended results (i.e., strategies to outcomes) is consistent with Open Standards goals and objectives guidance while also serving the Conservancy's organizational needs. The minimum goal statement generated during this component of CbD 2.0 will later be finalized into an outcome statement. Please see Appendix I for a crosswalk of commonly used terms to describe actions and intended results, including the terms used by the Conservancy in CbD 2.0.
Review evidence to determine any socially or scientifically identified thresholds for improving identified challenges. The point of this step is to reach agreement on what a sufficient amount of change is in the key challenge(s) that constitutes a contribution to systemic change. This is different than identifying the final goal of the program (this happens later). The idea here is to set a minimum bar that will be used to screen strategies, ensuring that any that go forward will be sufficiently impactful. An alternative approach that chooses the most impactful strategy considered may fail to choose strategies that contribute to systemic change. For example, a key challenge may be that water pollution by pesticides is causing declines in endangered amphibian populations and driving high drinking water treatment costs. Previous research may have identified a pesticide contamination threshold below which the target amphibian species are no longer affected (say that threshold is 25 ppt of pesticides). Separately, water treatment costs usually follow a step function, where treatment costs do not decline linearly with contaminant concentrations, but rather are dramatically reduced below a concentration threshold (say the treatment cost threshold is 50 ppt). A minimum goal statement for this key challenge could be to reduce pesticide concentrations to 25ppt or below in key amphibian breeding areas and to 50ppt at drinking water withdrawal points. This minimum goal statement indicates that strategies that do not lower pesticide concentrations to at least these levels in these locations will not create sustainable systemic changes in the key challenge. Strategy mapping may reveal that some strategies will reduce pesticide concentrations even further, information that will inform the creation of the final objective statement in later steps. But any strategy that is not projected to at least achieve the minimum goal(s) will be deemed insufficient. There must be a goal associated with one or more of the key conservation challenges in the situation analysis – otherwise this is not a conservation project. Define acceptable threshold of change for each problem that all relevant stakeholders agree would constitute success. When evidence is available, it should be used to guide the specification of minimum goal statements. There will be cases where no existing evidence can be found to support a specific, time bound, measurable minimum goal statement. In these cases, transparent and inclusive discussion should be used to reach agreement among key stakeholders on what amount of change would be seen by the group as a contribution to systemic change. The purpose of planning is to come up with successful strategies. Minimum goals need to point planners in the right direction, and to identify a minimum threshold for success, but do not need to be perfect, especially at this step in the process. Consider the temporal scale of the project when setting goals. For example, how long will it take to achieve systemic change that results in enduring improved conservation primary interest status and human well-being? It is possible that the minimum goal will be a 'means' statement aimed at a policy or practice change (i.e., water fund) that is achievable in 10 years. And that the health of the condition of the conservation primary interest (i.e., water quality) will be improved after policy/practice implementation (i.e., beyond 10 years). An understanding of what the ultimate goal or outcome the team is striving for might be useful, but then ask the team how much progress might be achieveable within the planning timeframe. 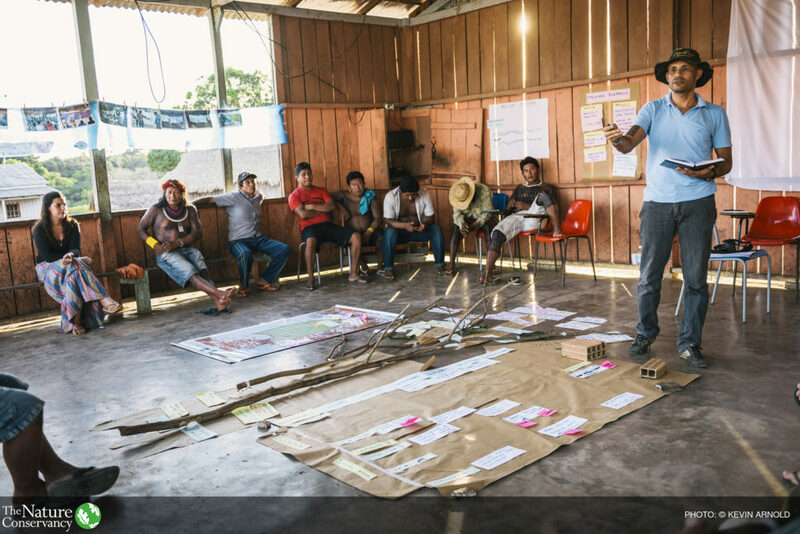 — not just conservation activities, but note the statement above about the temporal scale of projects aimed at achieving systemic change, and that in some cases the conservation outcome statement will be stated as a policy outcome. Teams also find it useful to have intermediate results or activity measures to be able to adapt and refine the project over time. Minimum goals for people should be specific and connected to conservation. Minimum goals related to people should specify which people (relevant groups, described earlier) and relate to key conservation challenges, not unassociated components of human well-being. For example, a stakeholder group may wish to cut employment in half in the focal system. If employment cannot be connected to any of the key challenges, then minimum goal statements should not include goals for employment. The goal may reflect contributions from multiple actors. The goal need not be entirely attributable to your organization. The point is to create a goal based on what is needed, rather than what you think is possible at this point in the planning process. Describe evidence for the goal statement. The broader review of the evidence can now be narrowed to a synthesis that supports the stated goal. Does the minimum goal describe a vision for conservation success consistent with the long term viability of conservation targets and systemic improvement in connected elements of human well-being? Note that the minimum goal may be an important intermediate result that will enable the team to achieve the outcomes of the project over a time period that extends beyond the plan. Do key stakeholders agree that the minimum goal is sufficient and representative of their interests at the intersection of conservation?